Two hundred years ago today, on June 18, 1812, President James Madison signed into law the United States of America’s declaration of war against Great Britain to start the War of 1812. Fought for a myriad of reasons from the illegal impressment of American sailors onto British Navy ships to help them fight France to land grab ambitions against Canada, the War of 1812 was derisively called “Mr. Madison’s War” initially by many Americans, particularly in the Northeast. Ill-prepared for the war with many untrained militia and without initial support from many individual states, America suffered a number of defeats, up to the capture and burning of Washington, D.C, including the White House and the Capitol building, in August 1814. In the book, Reliable and Religious: U.S. Army Chaplains and the War of 1812 by Kenneth E. Lawson, and published by the Office of the Chief of Chaplains of the Department of the Army, the heretofore untold story of Army Chaplains during the War of 1812 is explained in detail. Historically, during the Revolutionary War, “there were 174 Continental Army chaplains and 93 militia chaplains.” A number of New England clerics served at Concord in, with some even shouldering muskets and fighting alongside their fellow soldiers. This continued to be true in the War of 1812, as many United States Army chaplains even fought alongside the soldiers they served. All 13 U.S. Army ministers were Protestant, and they came from all over the United States—from Vermont all the way down to South Carolina. Two chaplains, Rev. Carter Tarrant and Rev. James Wilmer, died while serving as military chaplains. 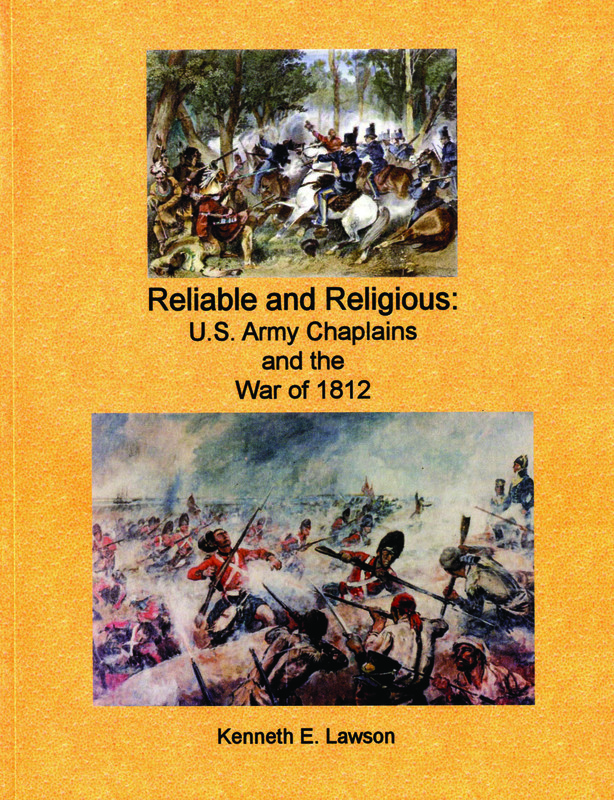 Reliable and Religious gives detailed accounts of the war and religious situation and chaplaincy activities in each state and territory during the War of 1812, including biographies of the chaplains who served in the campaigns in each state. 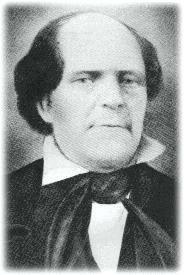 One of the more famous chaplains was Reverend Joshua Thomas, a fisherman turned Methodist minister who founded churches and preached along Virginia and Maryland’s Eastern Shore, often using his log canoe. Joshua and his wife Rachel were living on Tangier Island just below the Maryland-Virginia border during the War of l812, when the British took possession of the Island and used it as build the 100-acre Fort Albion as their center of operations as they plundered the Chesapeake Bay shoreline and prepared for their invasion of Baltimore. Image. Reverend Joshua Thomas, “Parson of the Islands”. Source: Findagrave.com. 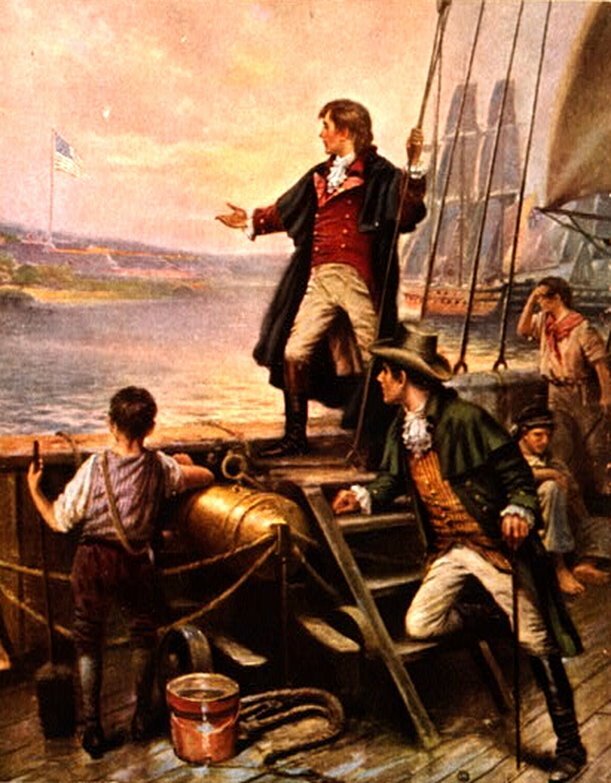 Thomas, dubbed “Parson of the Islands”, was held in esteem by the infamous Admiral Cockburn who asked the minister to preach to 12,000 British troops as they prepared to go to war against Ft. McHenry in Baltimore. On September 11th, 1814, on Tangier Island, Parson delivered his famous, fiery sermon, “Thou Shalt Not Kill,” with its dire prediction to the British that they would be defeated at the upcoming Battle of Baltimore. Image: Rev. 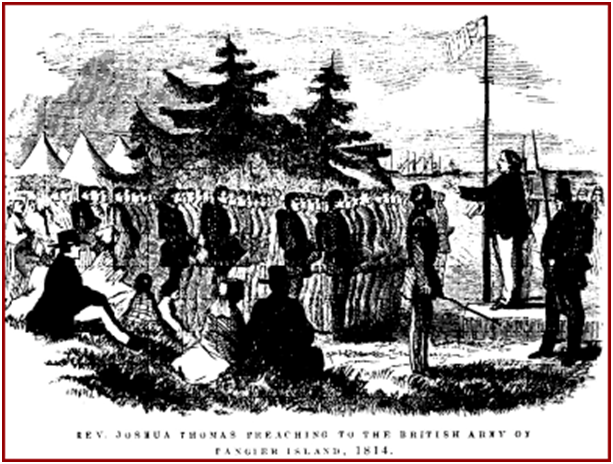 Joshua Thomas gives his “Thou Shalt Not Kill” sermon to British troops before the Battle of Baltimore in 1814 on Tangier Island. Source: “The Parson of the Islands” by Adam Wallace. According to Lawson’s research, Rev. Thomas warned the British “of the danger and distress they would bring upon themselves and others by going to Baltimore with the object they had in view” and told them “it was given to me by the Almighty that they [the British] could not take Baltimore and would not succeed in their expedition.” His sermon turned out to be correct, as the Redcoats were turned back at Fort McHenry, with Francis Scott Key looking on and scribbling away. To this day, the coastal Maryland celebrates “Joshua Thomas Day” in his honor. During the Civil War, the Army Chaplaincy developed many procedures still in place, and most chaplains became less a “fighting parson”, and more “spiritual” in their emphasis. After the Civil War, in fact, chaplains were no longer permitted to carry weapons and are presently supposed to be issued a Geneva Convention Identity Card. Today, the United States Army Chaplain Corps consists of highly educated (college degree plus theological graduate degree required) chaplains who are ordained clergy and endorsed by their particular faith group to serve all people, regardless of religious or non-religious affiliation. Most are typically embedded with the troops in deployed combat units, at service schools, military hospitals in the field and at military installations around the world. Since July 29, 1775, approximately 25,000 Army Chaplains have served as religious and spiritual leaders for 25 million Soldiers and their Families. Always present with their Soldiers in war and in peace, [U.S.] Army Chaplains have served in more than 270 major wars and combat engagements. Nearly 300 Army Chaplains have laid down their lives in battle. Six have been awarded the Medal of Honor… Currently, over 2,900 Chaplains are serving the Total Army representing over 130 different religious organizations… Their love of God, Country and the American Soldier has been a beacon of light and a message of hope for all those who have served our nation. Find War of 1812 Bicentennial information and events in the United States and Canada at www.Visit1812.com. I’m off to see the War of 1812 Bicentennial “Star-Spangled Sailabration” in Baltimore Harbor! HOW DO I OBTAIN the Reliable and Religious: U.S. Army Chaplains and the War of 1812 publication?